Bus from Kuala Lumpur to Kulim is the easiest and convenient method of transportation to travel between the two cities in Malaysia. With currently no train station in Kulim, many locals especially resident of Kulim who is working and studying in Kuala Lumpur prefer to take direct express bus back to their hometown, Kulim, from Kuala Lumpur. Plusliner, Kejora Express, Super Nice Grassland, Transnasional, and KPB Express are few bus operators offer bus from Kuala Lumpur to Kulim. Their combined trips have total up to 20 daily trips. These bus operators are very popular among the locals in Malaysia by providing excellent quality of bus service. The earliest departure goes at 10:00AM in the morning. The last bus leaves the bus terminal at night 11:30PM. The travel time from Kuala Lumpur to Kulim takes on average 6 hours depending on the road traffic and climate condition on your travelling day. Washroom break will be given during the bus journey. Additional break will be given upon request from the driver during the journey. The adult bus fare from Kuala Lumpur to Kulim is reasonably charging in a range of RM 36.90 to RM 40.20 depending on your selection of bus operator. The boarding point in Kuala Lumpur is either at Terminal Bersepadu Selatan (TBS), Hentian Duta Bus Terminal or Kajang Bus Terminal depending on your selection of pick-up location. The arrival point in Kulim is located at Kulim Bus Station. 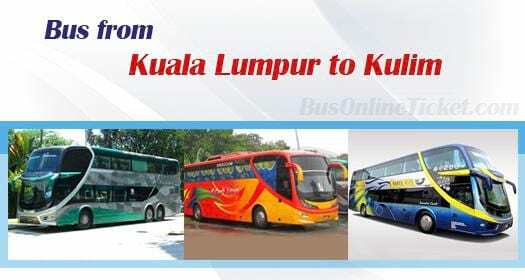 BusOnlineTicket.com is the most reliable and secure online ticketing portal in Malaysia and Singapore. You will get instant confirmation upon payment when you make your booking via BusOnlineTicket.com. With internet access, you can book your bus from Kuala Lumpur to Kulim in anytime, anywhere and any place at one's convenience.